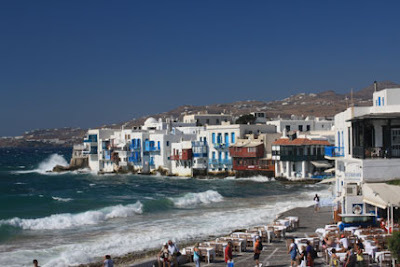 Mykonos is the smallest of the group of islands known as the Cyclades, which are prominent in stories from Greek mythology. The nearby island of Delos, touted as the birthplace of Apollo and Artemis, and now an uninhabited UNESCO site, has developed as a sacred center and archaeological site with remarkable Greek ruins, sights that bring many people to Mykonos. Streets wind in a maze through town. 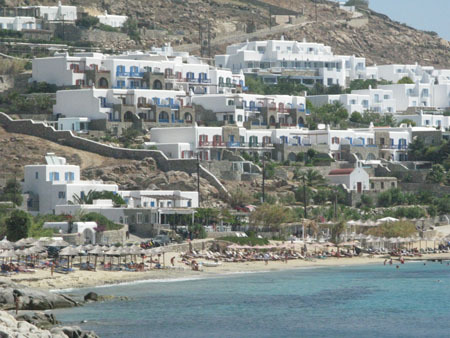 Tourists discovered Mykonos in the 1950s and 1960s and currently expand its population of 11,000 up to a million during the summer months. With rocky terrain and dry, windy, salt-infused air, conditions aren’t good for growing plants or animals, which means the economy depends on tourism—not difficult to achieve since the island is graced with beautiful scenery. 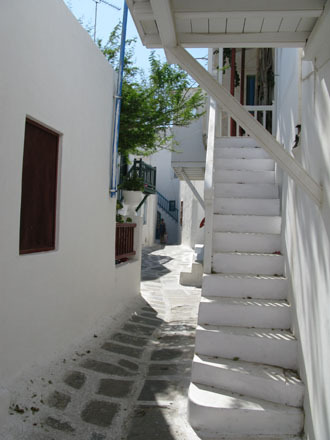 Despite its reputation as a cosmopolitan island, Mykonos has steadfastly avoided common traps of overpopulated destinations. You’ll find no fast food restaurants or neon signs on the island. Streets are narrow and curvy—to confuse pirates and protect homeowners in the old days—so it’s easy to lose your bearings. We chose a guided walking tour through the maze. For three hours we followed Amaryllis—think Sophie in Mama Mia!—whose British accent belied her life-long residency on Mykonos. After navigating safely through the city’s maze with her help, we felt confident to set off exploring on our own. 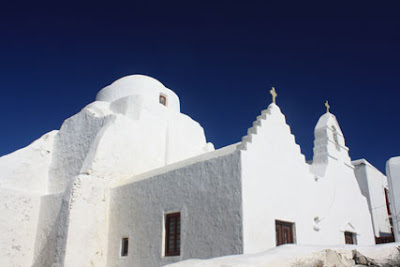 Churches have the same look--white washed with a blue dome. Mykonos strikes a captivating scene with its closely spaced white-washed buildings, all sporting flat roofs—conditions originally meant to keep homes cool and clean but now required by law on all new construction. The lime wash still used to make buildings white, a stunning contrast with nearby deep-blue ocean water, is claimed to be an antiseptic that’s beneficial for people living in close quarters. Shutters and doors may add specks of color, and people have chosen mostly blue and red. 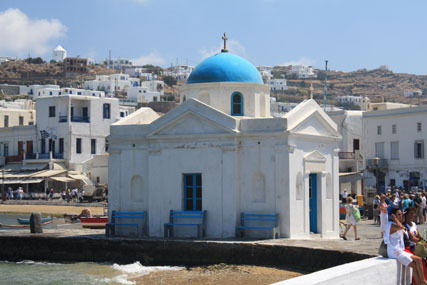 Among the most recognized of Mykonos’ landmarks are its windmills. Originally used to prepare grain for transport, the windmills are positioned near the harbor and at one time covered the entire western part of town. In the same vicinity, where town meets the ocean, is an area called “Little Venice” because its 16th and 17th century buildings were constructed on the edge of the sea with balconies overhanging the water. Ancient chapels and the Orthodox Christian Monastery founded in the 1500s are jewels of the island. Additionally, almost every family has a small private chapel dedicated to a specific saint. Families traditionally host large feasts and celebrations—open to the public--on their designated saint’s holy day. Festivals feature concerts, theater performances, and parties that attract visitors. Whether you love soothing, old-world tradition or seek exciting contemporary fun, Mykonos can be your paradise. 12 years ago, my good friend Eiko and I followed in the footsteps of "Shirley Valentine" (( Of movie fame )) to the Isłe of Mykonos. Stayed in the Taverna + swam in the crystal clear waters ~ so deep they say may go on forever... Met three generations, who appeared in the movies *wedding scene... Great story tellers! !